The 69th Australia’s MotoGP season is sure to be a stunner with 2016 Word Champion Marc Marquez.. In 2017 we are going to see some rider changes to the team that will spice things up and keep fans tuned in all season long. Sam Lowes is moving onto the premier class; he is making his MotoGP debut with Aprilla Racing Team Gresini, partnering with Aleix Espargaró, who is also new to the Aprilla team in 2017. Also moving into the premier class are Johann Zarco and Jonas Folger, both previous Moto2 World Champions who are now on the Monster Yamaha Tech 3 Team. The rest of the teams this year are: Hector Barbera and Loris Baz with Avintia Racing, Andrea Dovizioso and Jorge Lorenzo with the Ducati Team, LCR Honda is represented by Cal Crutchlow, the Marc VDS Racing Team welcomes Jack Miller and Tito Rabat, Maverick Viñales and Valentino Rossi with Movistar Yamaha MotoGP, Danilo Petrucci and Scott Redding with OCTO Prama Yakhnich, Karel Abraham and Alvaro Bautista with the Pull and Bear Aspar Team, KTM Factory Red Bull Racing Team repped by Pol Espargaro and Bradley Smith, Dani Pedrosa and Marc Marquez on the Repsol Honda Team, and Andrea Iannone and teammate Alex Rins ride on SUZUKI ECSTAR Team. With all of these champions in the mix it will be riveting to watch and see who rises to the top of the deck in the Australian Motorcycle Grand Prix circuit. The first race will take place on March 26 at the Grand Prix of Qatar on the Losail International Circuit in Lusail. The season consists of 18 rounds ending November 12 at the Gran Premio de la Communitat Valenciana in Valencia, Spain. This season takes Aussie MotoGP all over the world, competing with riders from Japan to the United States. Changes have been made to the regulations in Australian Motorcycle Grand Prix such as the protocol during pit stops. A rider can only be assisted by up to four mechanics in the middle of a bike change pit stop and all of them must be wearing approved helmets. While a mechanic is allowed to hold the clutch lever on the bike, only the rider is allowed to select a gear. I’m sure this new rule will be closely monitored for compliance by MotoGP judges. Another regulation change is the ban of winglets. Starting this season, no additional aerodynamics aids will be allowed on the bikes due to safety concerns. This may limit the mods on bikes a bit but will no doubt level the playing field a bit. For all of you MotoGP hobbyists out there, you can watch a race up close in your own backyard on October 22, 2017. Australian Motorcycle Grand Prix will be hosting the race at Phillip Island Grand Prix Circuit on Phillip Island, south of Melbourne, Victoria. Tickets aren’t yet available but you will not want to miss it. The Aussie MotoGP race course has been around for over 80 years and is a blast to watch. 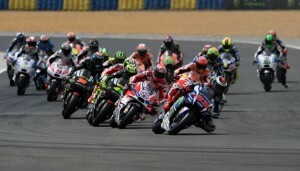 If you can’t make it to a race this season there is always the Videopass option available at motogp.com. Watch anywhere you are in the world – even if you’re on holiday!